LONDON - With tensions between the United States and Iran mounting over Tehran's test-firing of mid-range ballistic missiles, Iran's hardliners appear emboldened. They talk now of having a chance of winning their country's presidential election in May - or at least turning incumbent Hassan Rouhani into a lame-duck president, if he does manage to secure reelection. Observers say Rouhani had hoped a nuclear deal with the West would strengthen his political position. The deal was concluded during the administration of President Barack Obama. Public disapproval of President Donald Trump's ban on Iranians entering the U.S., currently suspended by the American courts, and the absence of any obvious economic benefit for ordinary Iranians from the deal, appear to be boosting the prospects of a hardliner winning in May - or at least it is adding to their hopes of doing so, say analysts. The hardliners have yet to pick a candidate: but there's talk their standard bearer might be Qassim Sulemani, the head of of the foreign legion of the Iranian Revolutionary Guards Corps (IRGC), the Quds Force. He's been overseeing Iran's military intervention in Syria. If Sulemani does get the nod, then it will signal that Iranian conservatives really do think they have a chance to pull off a win in three months' time. Another possible hardline pick is Ezzatollah Zarghami, a former boss of the Islamic Republic of Iran Broadcasting, according to Saeid Jafari, an Iranian journalist. The 57-year-old Zarghami, an IRGC veteran, was added to the European Union sanctions list in 2012 for what Brussels deemed "gross human rights violations" related to the state broadcaster's coverage of the disputed 2009 presidential elections. "Although Zarghami has denied the possibility of his own candidacy, he has behaved in a way that can be interpreted as preparing for the elections," Jafari said on the news site, Al Monitor. Zarghami oversaw the expansion of Iran's state broadcaster, including the launching of English-language PressTV and Spanish-language HispanTV. On Instagram in December, Zarghami warned Rouhani that 2017 will not be like 2013 when Rouhani first won the presidency because he will be defending a record rather than campaigning as an insurgent. Last April, moderates and reformists won a working majority in the Iranian parliament for the first time in more than a decade. Hardliners won just under a third of the seats in a humiliating performance that appeared to position Rouhani for this year's presidential contest. April's results were seen as an endorsement of the nuclear accord that Rouhani's government signed with the U.S. and other world powers to curtail Iran's nuclear program in return for the lifting of international sanctions. Trump's upset election win, his threats to rip up the 2015 nuclear deal, and his aides' talk of fostering regime change in Iran, are all seen by conservatives as opportunities by Iranian conservatives to reshape politics in the Islamic Republic. After the November U.S. elections, the official newspaper of the IRGC, Sobhe Sadeq (True Dawn) said in an editorial, "With the presence of Trump, in practical terms, nothing will be left of the nuclear deal." 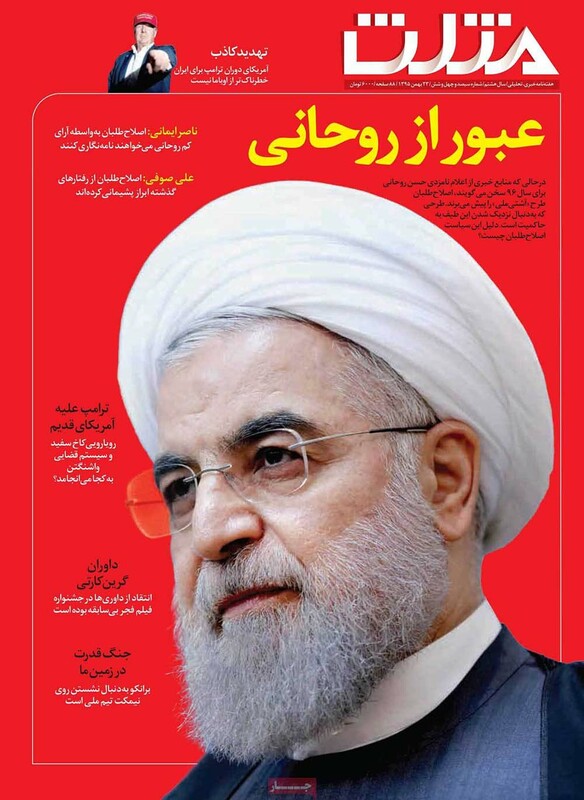 The paper reported that the nuclear agreement was viewed by the Rouhani government as its "winning card" for the presidential election, but with Trump it "will be transformed into the Achilles Heel of the administration." Aside from Trump's threats to rip up the deal, frustration with the economy is building among ordinary Iranians. Rouhani, during his campaigning for the accord, had led them to believe that lifting the sanctions would have a quick impact. The economy indeed has improved as a result of the deal, growing by 4 percent last year, and the International Monetary Fund had predicted growth to reach 6 percent this year. Most Iranians, however, have not seen any turnaround in their lives. According to a recent poll conducted for the Center for International and Security Studies at the University of Maryland, 63 percent of Iranians see Iran's economic situation as "somewhat" or "very" bad. Nearly 73 percent say living conditions have not improved as a result of the deal. Analyst Michael Rubin of the American Enterprise Institute, a Washington DC-based research institution, says the U.S. should be making it clear that the economic benefits from the deal have not trickled down because of graft and a rigged system, one that helps fund the IRGC. He says Washington should be helping to "expose bank accounts and corruption, and do it in a way that 80 million Iranians can hear." Rubin doesn't fault the Trump administration for wanting to confront Iran. "There's nothing wrong with a no-nonsense approach," he adds, but added there's danger in speaking loudly, "while waving a small stick." The stern talk from the U.S. has included a warning from Trump's national security adviser, Mike Flynn, that the U.S. has officially "put Iran on notice." Reprisals are threatened and on February 3, Trump imposed fresh sanctions on Iran, but they affected only 13 Iranian individuals and 12 companies. Rubin maintains this is just replicating "the worst of Obama," by "utilizing red lines as a rhetorical tool without the preparation and will to enforce the threat." Rubin, like some other Americans who advocate a more aggressive policy, would like to see clear practical steps taken by the Trump administration to contain what they argue is an expansionist Iranian regime - ones that make it costly for Iran's hardliners but also erode public support for them. Otherwise, they argue, harsh rhetoric without tougher action will merely embolden Iran's hardliners. Washington's talk of applying more pressure on Tehran is prompting alarm in European capitals. Last week, the 28-member bloc's foreign affairs chief, Federica Mogherini, was in Washington for talks and while emphasizing the importance of the nuclear agreement being "fully implemented in all its parts by all sides," she made it clear the EU doesn't have an appetite for confrontation with Iran. "The European Union and its member states continue and will continue, as the nuclear deal is implemented, to have open channels with Iran," she said. The European Union is "not introducing additional sanctions" on Iran, she added.